Waukesha, Wisconsin is seeking to divert water from Lake Michigan to replace what it asserts is a shrinking supply of groundwater. Click image to enlarge. 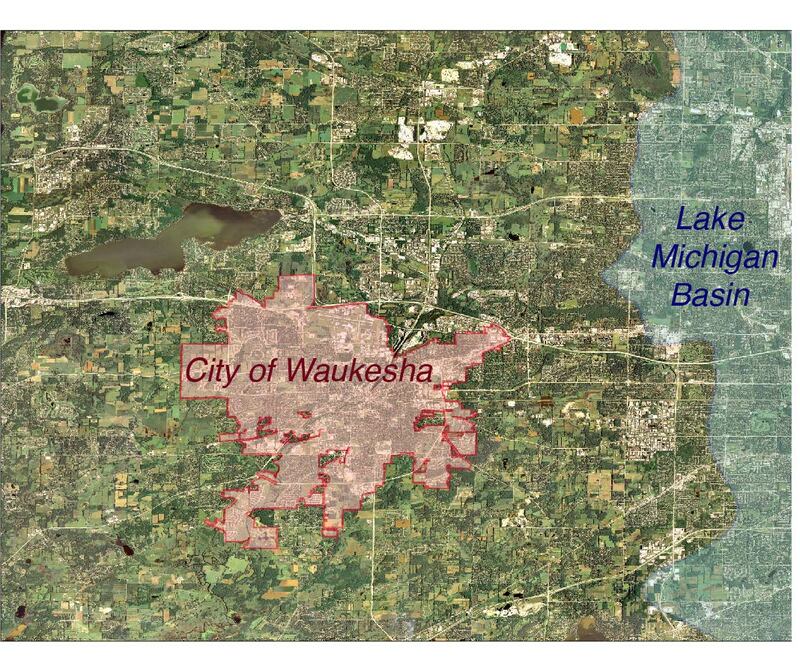 The city of Waukesha, Wisconsin lies about 1.5 miles west of the divide between the Great Lakes Basin and the Mississippi River Watershed. Click image to enlarge. Four years ago, Waukesha first proposed to pipe over 10 million gallons of water daily from Lake Michigan. In seeking water from Lake Michigan, Waukesha’s proposal became the first formal test of the water diversion rules under the Great Lakes Compact. 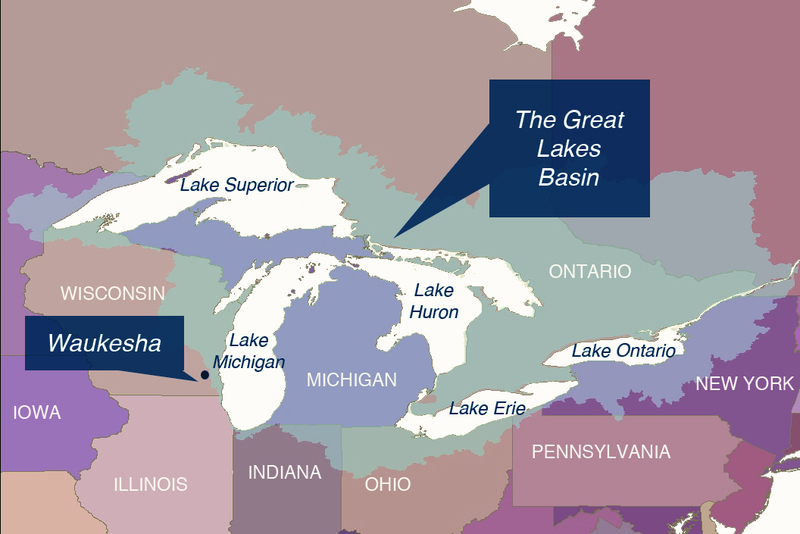 The agreement, negotiated by eight states, two Canadian provinces, and two federal governments, banned diversions of water outside of the Great Lakes watershed. But the compact included an exception for cities within counties that straddle the watershed boundary and prove a real need. One of those cities is Waukesha, which lies within the Mississippi River Basin; about 1.5 miles west of the Great Lakes watershed divide. Data provided by the City of Waukesha and given to Circle of Blue by Steve Edlund show clearly that water levels in the City’s deep aquifer supply are rising, not falling as Waukesha officials assert in an application to draw its water from the Great Lakes. Click image to enlarge. In making its case to the Wisconsin Department of Natural Resources, the Waukesha Water Utility painted a picture of a community backed into a corner of aquifer depletion and contamination, without any other option but to pipe in water from Lake Michigan. Waukesha cited what it said was a worrisome groundwater decline of five to nine feet per year on the first page of the 2010 version of its application. Those figures were removed from the 2013 version of the application. But Waukesha persisted in asserting that the water levels in the city’s aquifer are still dropping. The new application simply cites a “decrease in the rate of water level drop.” No mention of the city’s measurement data could be found in the new application. “Clearly the claim of declines of five to nine feet per year is no longer valid. Nor is the claim that the aquifer’s use isn’t sustainable, because of the rapid decline,” Cherkauer said. 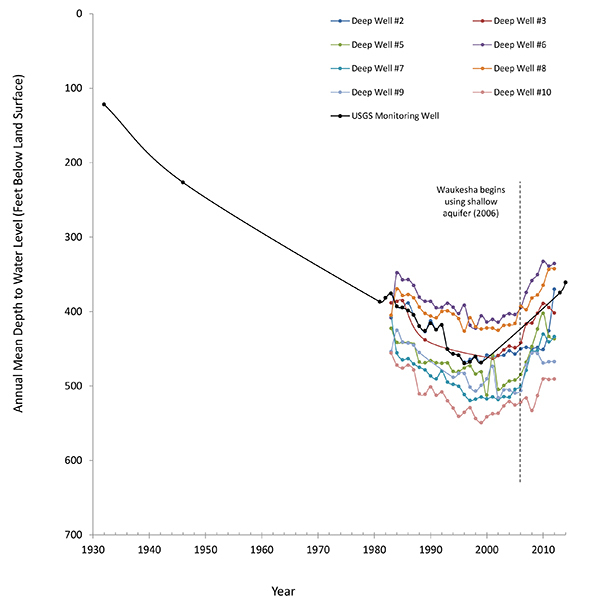 Is the Groundwater on the Rebound? Water conservation and water use efficiency have resulted in the city using less water. Since 2006, the city has been withdrawing as much as 20 percent of its water supply from the shallow aquifer, reducing deep aquifer withdrawal. Waukesha’s deep wells have recently been out of service for extended periods to accommodate major repair or maintenance activities. Static groundwater levels rise when wells are not operated. Several water utilities in Waukesha County abandoned deep wells or drilled new shallow aquifer wells. Going forward, however, tighter well regulations are likely to make siting of shallow wells more difficult. If less water is withdrawn from the deep aquifer and more from the shallow aquifer, then deep groundwater levels increase. However, reducing deep aquifer pumping and increasing shallow aquifer pumping produces adverse environmental impacts on wetlands and reduces baseflow to lakes and streams (See Volume 5 of the Application, Environmental Report). If less water is withdrawn from the deep aquifer when groundwater systems convert to a Lake Michigan supply, deep aquifer groundwater levels increase. This happened near Milwaukee, Brown County, WI, and Northeastern Illinois. However, the rebound of the aquifer was temporary as, over time, development drove more groundwater use and the deep aquifer declined again. The deep confined aquifer is not sustainable and it is not prudent to base long-term water supply planning on it. No mention was made of possibly the most relevant fact of all – that Waukesha has proposed to return at least 100% of the volume of water withdrawn, meaning Lake Michigan water is preserved and protected. No mention was made of the shale layer that restricts the recharge of our current primary water source. The 2050 population projection is incorrectly cited, creating a false impression of aggressive growth. The article cites the City’s current population of about 71,000, but later incorrectly says the City’s population will grow to 97,400 at buildout in 2050. The actual population projections at buildout are 76,300 for the City and 97,400 for the service area. While the population served increases by about 26,000, about 10,000 of this service population resides in the area today and is served by private wells (See Volume 2 of the Application, Water Supply Service Area Plan). The claim that the City is seeking water to allow sprawling growth is not supported by state and regional population projections. It is not supported by approved land use plans through 2035. With an actual projected population growth rate of 0.5% per year, statements like “The amount of water Waukesha seeks . . . is designed to allow the city’s sprawling growth pattern to expand” are not true. If you had asked about this issue, I could have provided you with the facts. Kaye LaFond responds: In terms of a “temporary” and “localized” increase, it is worth noting that the aquifer has now been slowly recovering for 14 years, and that data presented in the 2013 NWF report shows similar increases in other counties – we have to wonder how Duchniak is defining “localized”. What’s more, while the statement reminds us that an increase in shallow groundwater pumping could harm local wetlands, it does not acknowledge the possibility of simply continuing to pump groundwater (deep and shallow) at the current pace, and monitoring the response of the deep aquifer. With Great Lakes water at stake, surely this is an option worth exploring. The city argues that continuing to pump water at the current pace does not allow for projected growth in population or consumption. However, those numbers have been questioned not only by a host of environmental groups, but also by the Wisconsin DNR. In response to the DNR’s request for more justification of the demand projections, a technical memorandum was provided by the city, which cites the desire of current industrial customers to increase pumping rates, as well as potential development of new industries. Understanding that the Great Lakes Compact does not seek to provide out-of-basin diversions to support industrial water use, it remains unclear as to whether Waukesha’s diversion falls even remotely under the requirements of the Compact. Lake Powell is filling up now. On the rise, but the Bureau of Reclamation does not want to spill the beans yet. The state of Michigan has been diverting the Great Lakes water for several years as the deal former Michigan governor John Engler set up for Nestle’ Ice Mountain water bottles. To add insult the Michigan Republicans refuse to allow any plastic container deposits on the water leaving the Great Lakes or in Michigan, thus adding to the pollution of land and waters. The no plastic deposits has cost the residents of Michigan tens of millions of dollars. Mr. Duchniak does a great job of explaining some basic facts about the deep aquifer withdrawals in the area. The use of this systems is not sustainable at current rates – regionally or locally. The city has done what it can to move towards other sources that are less fossil water and more runoff. The shift to other supplies is understandable given the various arrangements made in the Compact to only use the Lake if there is a strong argument. Long-term, the city is on the right side of this discussion. Are you aware of a scientific study that shows the deep aquifer to be unsustainable for the next 50 years, even with reduced dependence by the potential for induced aquifer recharge or river bank inducement? Or, a study that shows Waukesha must begin construction for a Lake Michigan Diversion immediately due to a pending dire need? Do you believe that the City of Waukesha needs Lake Michigan water even though the city population is expected to grow by 4500 people through 2050 and the deep aquifer static water level from the surface hasn’t dropped since the 1990’s? In fairness, background on the utility service area would be appropriate as the most concerning point of the application for the need (vs. want) of a Lake Michigan Diversion Exception. The service area was expanded prior to the application to include 4 other communities previously not on the deep aquifer system, most are shallow water private wells. With a Lake Michigan source, those communities would receive water from the city at the retail level from Waukesha as the wholesaler. The statistics cited by Mr. Duchniak are absent of industrial and commercial development. The criteria for a diversion exception does not include providing water to one community and redistributing it other communities that fail to plan within their own resources. That would be like piping water Lake Michigan water to Las Vegas. It’s easy for those who don’t live in Waukesha to say the city doesn’t need Lake Michigan water, citing the aquifer data. I’ve heard both sides of the argument, and I’m still unclear of the situation of rising and falling aquifer levels. However, as a resident, I’m concerned about the radium levels in the water. That is the bottom line here. Hi Jason – I do acknowledge in the article that radium is an issue in terms of Waukesha’s water supply. My bottom line, however, is that the City misrepresented the state of the aquifer in a very important and precedent-setting bid for Lake Michigan water. I am wise to the fact that somewhere down the line, a straddling community will need water from the Great Lakes – so be it. However, these exceptions requested under the Great Lakes Compact should be held to the HIGHEST standards of transparency and scientific integrity. Follow the money, I agree with Kaye, something about this stinks. Either this is a test to see how easy/difficult it will be break the compact for future CORPORATE GREED or an over reactive community. I’m leaning towards the CG. A November 2014 confidential memo from the former Waukesha City Administrator and Mr. Duchniak updated the Waukesha Common Council on the status of the Diversion Exception application with the review by our DNR. The memo concludes that if the DNR concludes that the application is approveable and Waukesha receives approval from the other 7 Great Lakes states, that construction will not be complete until 2020. Waukesha is under a stipulated court order to be radium compliant by June 2018. They state in their memo that if they receive the approval they will seek an extension for the 2018 deadline. That is very very unlikely given that Waukesha can install radium filters on it’s remaining deep aquifer wells for a fraction of Lake Michigan water. Bottom line is that Waukesha does not have a radium problem and as Kaye pointed out, Waukesha’s water supply is a matter of community development within the means of your available water supply i.e., California.